Looking to keep it low-carb for dinner? Look no further! 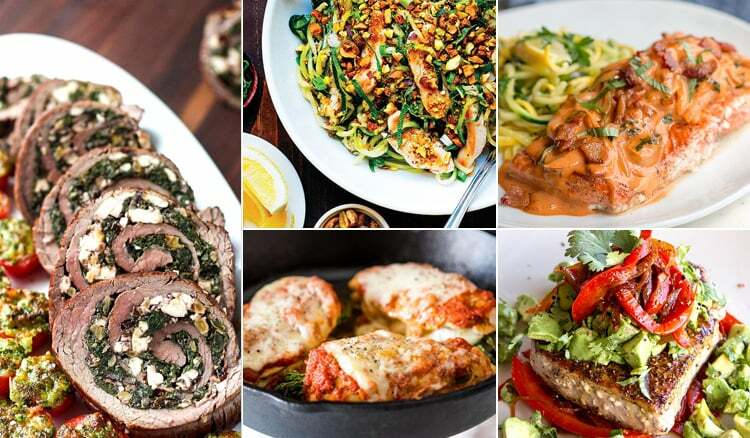 Whether you’re doing the keto diet for weight loss or healing – or you’re just feeling like you need a little cleanse from the starch – these delicious low-carb, keto dinners are worthy of going into the nightly rotation. If you’re unfamiliar with the ketogenic diet, basically it means really low-carb. It is sometimes also referred to as LCHF or the low-carb, high-fat diet. It differs from person to person as to what the threshold is, but we’re talking BELOW 30 grams per day, if not less. This doesn’t mean an all-meat diet; in fact, the major focus is on fat consumption which is what you want! After all, too much protein can be a bad thing. Finally, it doesn’t mean eliminating all veggies. It will simply emphasize leafy greens and cruciferous veggies which are high in fibre and low in net carbs. Want to learn more about keto and low-carb, high-fat diet? Read Keto Diet Explained – Q&A with Leanne Vogel here. Now that we’ve gotten that out of the way, let’s get into some healthy keto dinner recipes that are low in carbs and high in satisfactory, rich, and high-fat flavour. Enchiladas are a no-go on the keto diet, but that’s why we turn things into casseroles… right? The thing is, it’s an easy format to build upon with meat, cheese and veggies. Plus, it’s a fantastic dish to meal prep and dig into later in the week. Casseroles tend to get better overnight when the flavors have time to meld, after all. This is all your buffalo chicken dreams including a healthy dose of queso fresco. This is a full meal that your entire family will love. Whether you’ve got Italian roots or not, there’s no denying that chicken Parmesan is a classic, well-loved meal. There’s just so much to look forward to in each bite from the tender, roasted asparagus and luscious sour cream wrapped inside of the chicken to the ooey, gooey cheese that covers them… you won’t even miss the breading in this baked, low-carb rendition. Caprese salad is fun and all, but why not make it a little more exciting? Hasselback is usually reserved for potatoes, but medium-large chicken breasts will work quite well on the keto diet instead. These guys are stuffed to the brim with mozzarella cheese, tomatoes, fresh basil and a balsamic drizzle. You could serve it over more greens if you like. There will be no ordering pizza on the keto diet unless you pull off the toppings and ditch the crust. In that case, you might as well put a little effort into making this casserole. It’s got all the toppings you love like Italian turkey sausage, pepperoni, mushrooms, fresh tomatoes and mozzarella all baked together for awesomeness beyond compare in any bite. Get you pizza pie fix the low-carb way. This recipe is the perfect light summertime “pasta” dish with a vibrant and zesty zoodle base. It’s a colourful dish with sliced, grilled chicken on top and a crunchy pistachio garnish. It’s all finished off with a bit of fresh lemon, mint, and scallions so the flavour is all there with a rather simple list of ingredients. Perhaps the most important part of transitioning to the keto diet is finding out inventive ways to replace noodles. We’ve got options here, and you’ll see more where that came from. This lasagna ditches pasta for cabbage instead, bringing in some leafy green fibre. Layer it up with ricotta, beef, and more cheese, and you’ll want to dig into this one all week. Plus, who can complain about a one-dish meal? Who said you can’t have nachos on the keto diet? When you utilise zucchini – undeniably, one of the most versatile veggies – you can have your loaded nacho plate and eat it too. Perhaps the best party of this dish though are the toppings which would be delicious on just about everything. The cherry on top is DEFINITELY the MCT guacamole, using MCT oil or medium-chain triglyceride oil (it’s good for ya, trust us) to boost the nutrition and especially the healthy fats. We love a complete meal, especially when it looks this pretty! Flank steak is really economical which is a great budget tip as keto can get really expensive with all the meat, quality fats and exotic cheeses if you’re livin’ it up over there. Plus, we have a good dose of greens, walnuts – one of the healthiest nuts for you – and a tangy dose of creamy feta to boost fats and flavor. Grilling season is perfect for keto’ers. You can grab some meat and some low-carb veggies and go to town. BBQ parties and cooking out is no threat to keeping things low-carb for the savvy “dieter” with kebabs like this one, loaded with color, flavor and nutrients. Plus, you’ll impress everyone with a solid chimichurri recipe that has “put it on everything” potential. Perhaps you like your beef of the corned variety. If so, this one is for you. While your local deli is probably dishing out those dreamy Reuben sandwiches you can’t indulge in, you can create your own magic. This recipe includes a cheesy keto dough that you can use for countless recipes when you need your “bread” fix. It’s loaded with the usual fixings including the beef, Swiss cheese, kraut, and a sugar-free Russian dressing. Pizza is kind of a hot topic on keto. From pizza casserole to low-carb crusts, it’s not too hard to make it happen. Of all the options, though, meatza has something going for it. It doesn’t involve concocting a low-carb crust; instead the meat is the crust. Yes – this is our idea of eating healthy, and we kind of like it compared to run of the mill chicken and broccoli. This is topped with cheese, tomato, and spinach, but we encourage you to get creative. Once again, it goes without saying that you could easily construct a good cheeseburger without the bun on the keto diet. On the other hand, you could turn it into a casserole instead. With easy slicing ability, this one-pan dish will serve up delicious leftovers all week. Plus, it’s totally kid-friendly and you could even toss some in the freezer for easy reheating later in the month. If you’re new to keto and low-carb eating, we highly recommend this 30-day program run by our favourite keto expert and author Leanne Vogel. Her book The Keto Diet is also fantastic, but if you want a more structured approach with meal plans, shopping list, community support and so on, than this might be for you. Sometimes, you need to switch up your steak. This tuna dish is perfect for that! With a bit of Mexican flair, the spice in the sear is just perfect. Plus, it’s loaded with a boost of naturally sweet red peppers and a gorgeously creamy, high-fat avocado salsa. This is a simple 30-minute meal you can easily pull together on a weeknight. While Alfredo is seldom seen as a healthy dish, people usually knock on the high-fat sauce. We’re knocking on the pasta here instead, because we’re down to dig into some heavy cream and butter in this gorgeous “pasta” dish. Instead of wheat, it uses Shirataki noodles – a keto must if you’re missing spaghetti, fettuccine, or rice. This dish is topped with blackened shrimp. Add some spinach or broccoli for some greenery if you’d like. Poke is generally pretty keto-friendly if you take out all the rice and eliminate sweetener from the sauce or marinade you use… and thank goodness because it’s so darn good! It can easily be ordered out, too, with modifications. Alternatively, you can make it at home with this awesome recipe including creamy avocado, sesame seeds, coconut aminos and sesame oil for the sauce so it’s paleo-friendly, and fun additions of pili nuts and grapefruit for some unique flavor and texture in the mix! This one is a tripple whammy with shrimp, bacon, and smoked salmon. We’ve got plenty of healthy protein mixed with healthy fats here. Plus, it’s a skillet meal for ultimate ease. Save this recipe for quick weeknight keto inspiration. If you want to get fancy, this is your dish. Scallops are a fantastic choice for protein while chorizo brings in a punch of flavour that can’t be beat while giving the dish a little substance with – you guessed it – fat! The creamed spinach is the perfect bed to serve this hearty recipe on. If you’re cooking keto for a crowd, consider whipping up this one. Tomato vodka cream sauce is rich and delicious, but too often, it’s reserved only for big plates of pasta! Instead, top off a gorgeous piece of wild-caught salmon with the stuff and you’ve just made it keto. You could also serve it with some spiralized zucchini on the side to get your veggie and pasta fix. This meal is decadent and it’s ideal to make for a special occasion or guests. Can you tell that the trick to making keto delicious is removing ‘x item’ and instead placing the contents of the shell, the roll, the wrap or the bread into a bowl? It’s kind of brilliant. Egg rolls are deep-fried awesomeness, but they’re also loaded with carbs and refined oils. This bowl’s got none of that yet ALL the flavor you’re after with a vibrant boost of veggies, tasty ground pork, coconut aminos so it’s soy-free, and a garnish of sesame seeds. A great trick to staying on track with keto is to take advantage of hands-off cooking. This slow cooker recipe offers you the freedom to set it and forget it. You can come home to homemade Zuppa Toscana that would give Olive Garden a run for their money, and those endless bread sticks won’t tempt you while you wait for the main course. Besides, this dish is hearty enough on its own, packed with a creamy broth base, sausage and vitamin-rich kale. This Au gratin skips out on high-carb potatoes for low-carb spaghetti squash which holds all those ingredients together while offering a fibre boost – something you should keep in mind while following a keto diet. Oh, and did I mention there’s bacon? You may have been wondering where the pork is. Bacon and cheese are the dynamic duo when it comes to cutting carbs. Embrace it and eat it. Eat it often. You know we couldn’t leave this recipe roundup without something wrapped in bacon! This pork tenderloin is first stuffed with cream cheese, spinach, onion, and garlic for a creamy mixture you’ll look forward to with each bite. Finally, it’s cooked with a generous nest of bacon on the outside which packs in the tender juiciness in the pork itself plus that crispy, fatty outside that tastes like everything good about keto. Hopefully, you’ve found some recipes here you can look forward to making for dinners throughout the week. We’re here to help make healthy living and the keto diet easy for you! Share this recipe with your low-carb friends! Share this roundup on Pinterest from here. For more dinner ideas, check out our review of the best keto cookbooks. Thank you for featuring two of my recipes in this great roundup. I will share on social media. Thanks so much Kim! Your recipes are just lovely. Why don’t you give the nutrition information? I would like to know the net carbs of these recipes. Different people have different opinions on what they consider to be low carb.